Earlier this week, I posted my first review of an Ommegang beer with their Ommegang Abbey Ale. Now I'm back with Hennepin, another of their year-round offerings. 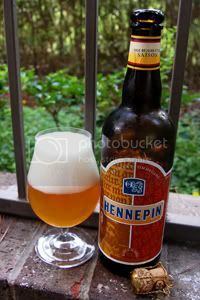 Hennepin is a Saison, and just like earlier with Ommegang, this is the first example of the style I've reviewed here. You know what that means, we get the obligatory "first review of a style breakdown." A refreshing, medium to strong fruity/spicy ale with a distinctive yellow-orange color, highly carbonated, well hopped, and dry with a quenching acidity. As you pour this rich golden ale into your glass, consider your surroundings. Are you in a restaurant? Outside on the deck? Is it hot and humid? Cold and brisk? Take a drink. Feel the way Hennepin is bright and lively in your mouth with a warming mix of spicy gingersnap and citrusy hops. Refreshing. Relaxing. It's true: no matter where you are, Hennepin is the perfect ale for all seasons. Refreshing and relaxing is just what I'm looking for right now. Let's hope it can deliver. Appearance: A nicely hazy golden-straw body with three fingers of slightly off-white, bubbly head that sticks around and leaves good lacing. Aroma: A honeyish malt body with fruity (golden fruit, citrus, and banana), yeasty, and spicy (clove, coriander, and pepper) notes. Some traces of booze, but not much. Taste: Up front, a sweet pale malt character with fruit, spice, and ever-so-mild molasses twinge towards the end. It's somewhat sour and dries towards the end. Hints of alcohol in the end, in just the right proportion. It may not the most complex flavor profile, but it's quite satisfying. Mouthfeel: Medium-light bodied and smooth with good carbonation. Crisp with a dry finish. Drinkability: Generally good, but reined in a little by the moderately-high alcohol content. Verdict: Hennepin is a great beer to sit down with an enjoy on a peaceful Summer evening. It may not be the most complex Saison out there, but it's still well worth a try. I haven't had a Hennepin in quite a while, but I remember being kind of disappointed with it the last time I had it. Maybe I was expecting more? It could be what you say, that it didn't bring the complexity one expects from a saison. Or from a good saison, I should say.